LE SupplyPRO is now LIVE and ready to service your agency! 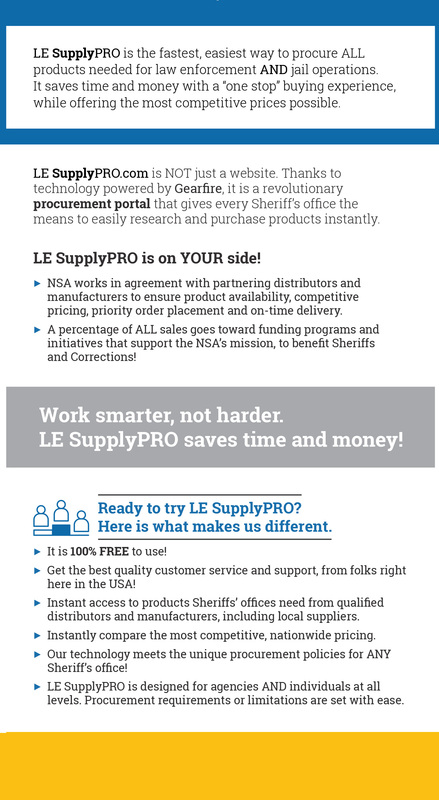 NSA Members Join LE SupplyPRO for FREE! 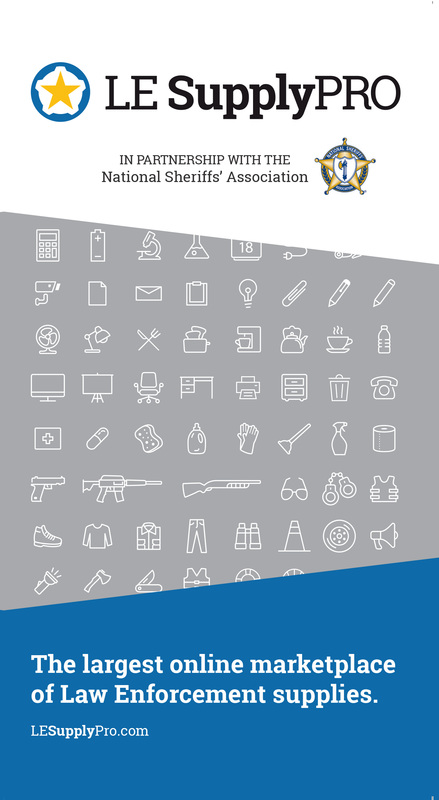 Procure your law enforcement supplies efficiently & economically. 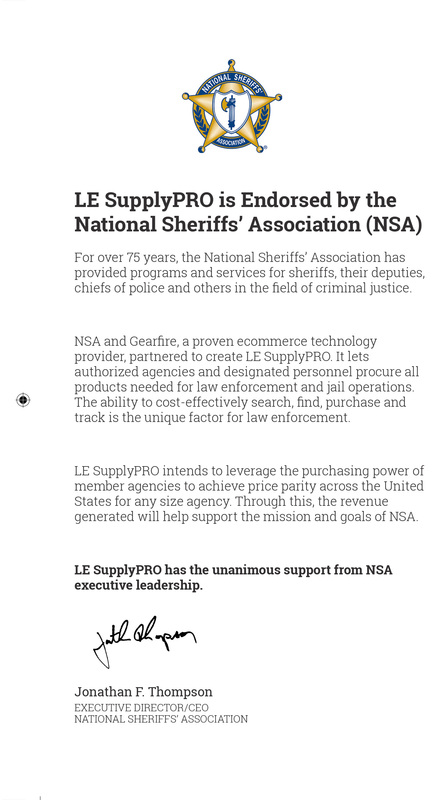 LE SupplyPRO (LESP) is an online portal, created by the National Sheriffs’ Association (NSA) in partnership with Gearfire, a proven e-commerce technology provider, allowing sheriffs’ offices nationwide the ability to instantly procure everyday supplies, uniforms, medical necessities, firearms, ammunition, gear, equipment and other products used in the conduct or support of law enforcement and jail operations. The portal allows authorized agencies and their designated personnel to procure the products law enforcement needs efficiently and economically. Taking advantage of the new online mobile economy that is changing every industry, the portal will provide 24/7 “always on” access to ensure sheriffs have complete control of procurement needs. The ability to cost efficiently search, find and purchase is the unique factor for law enforcement. 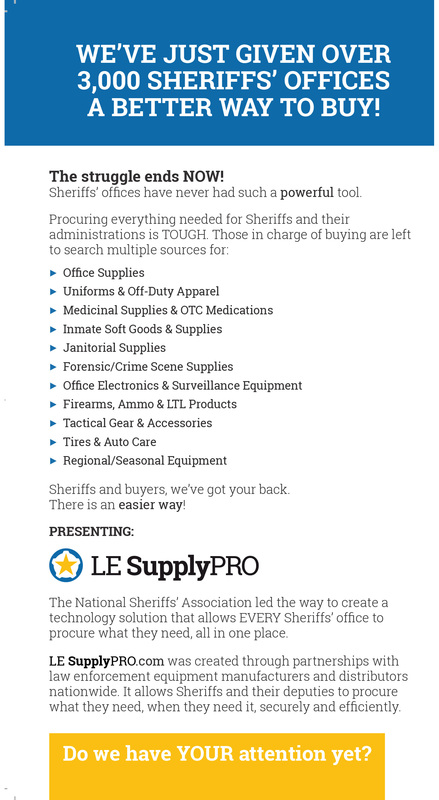 The portal is safe, secure, efficient and user-friendly, ensuring that each sheriff’s office will have at their fingertips the capability to research and purchase, in real time, products that have been selected for distribution from qualified wholesalers. Revenue generated will help support the mission and goals of NSA. 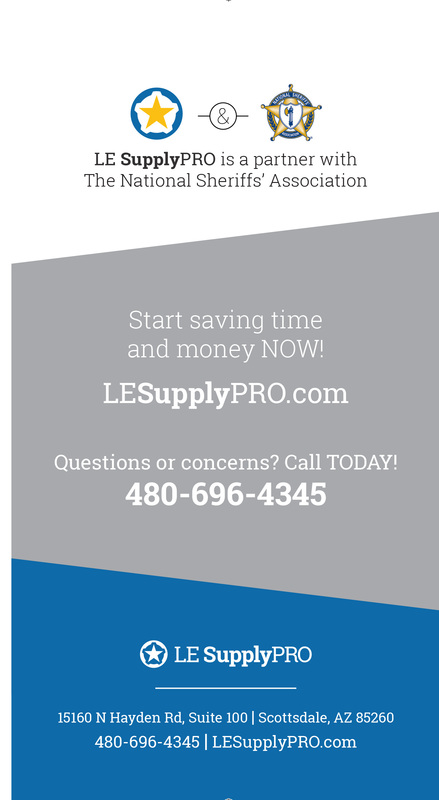 Download a copy of the LE SupplyPRO Brochure! 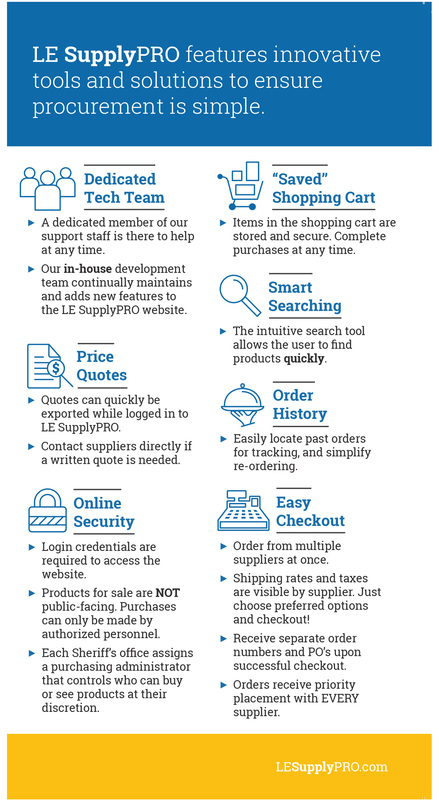 View a list of current LE SupplyPRO Partners here. Sign up for LE SupplyPRO here! For questions regarding Sheriffs Offices and/or State Associations please contact Lindsay Hopkins at lhopkins@sheriffs.org. For questions regarding Distributors and/or Manufacturers please contact Jody Eberhart at jeberhart@sheriffs.org.